Concentrate light in a small area and hightlight the product details. Add accentuation in portrait and beauty photography. Perfect as a hair light or dramatic accent light. Create even more effects with the included grid. 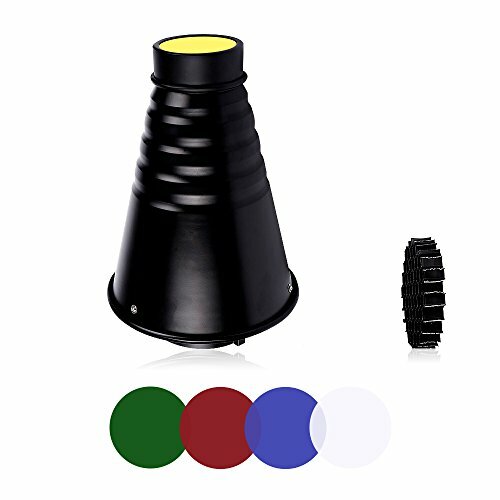 Coming with transparent, red, green, blue, and yellow five color filters, creating effect at different color temperatures. Made of all-metal material.Bowens Mount. Concentrate light in a small area and hightlight the product details. Add accentuation in portrait and beauty photography. Perfect as a hair light or dramatic accent light. Create even more effects with the included grid.